At Long Last, Bottled Pinot! 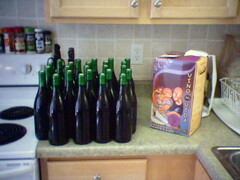 This Sunday afternoon, I finally took the plunge and bottled my Pinot Noir. It was a bright, sunny day, so the photos are particularly nice. The first step was to wash and sanitize all the bottles. 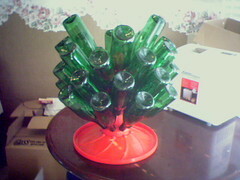 I did so with Iodophor, an iodine-based sanitizer, and hung them on the same bottle tree that I used for beer way back when. Isn't it pretty? Next came the actual filling and corking. I was lucky: the filling wand from my beer days left exactly the right amount of ullage in the bottle to contain the air compressed under the cork. It was also my first time using the corker. It's a medieval-looking thing, but all it does is compress the cork in a metal iris and then slide it into the bottle. It's all about mechanical advantage! For more of the story, check out this week's WineFix podcast, which I anticipate will be released tomorrow (Wednesday) evening. 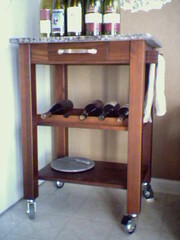 This is a much better picture (click it for a larger version) of the wine table Leslie got me for Christmas.